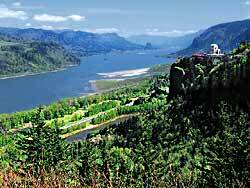 The wild Columbia Gorge is the home of world class wind surfers. The winds in the Gorge blow continually. Mt. Hood offers skiing and is close to Portland.